High in demand in logistic companies and several industries, our Pinewood Pallets for Warehousing is the most economical solution available in market. 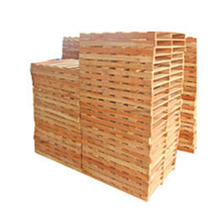 All these pallets are made from best quality pinewood that provides durability and strength. Specially designed for storage of heavy duty goods in warehouses, these pallets are available in different sizes for accommodating diverse requirements of clients. We stringently test these pallets on various parameters under load conditions. It has excellent surface finishing that makes it decay and termite protected. These are made to be reused and duly heat treated to withstand different climatic conditions. We have two way wooden pallets that can be lifted from both the sides and four way wooden pallets that are lifted from all the four corners.